Together with his wife Pearl Carr, Teddy Johnson formed one of the longest and most successful partnerships in British post-war light entertainment. Fame was indelibly stamped on them in 1959 when they came second in the fledgling Eurovision Song Contest with the irrepressibly chirpy Sing, Little Birdie. The song is remembered as much now for its use in a Monty Python’s Flying Circus sketch nearly 20 years later, a wickedly satirical quiz in which Mao Zedong steals a point from Lenin by incongruously identifying the name-checked pair’s Eurovision success. 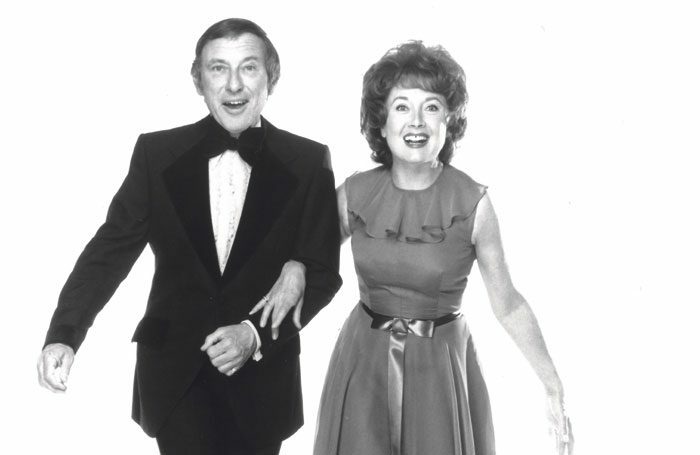 Hailed as ‘Mr and Mrs Music’, Johnson and Carr were celebrity radio and television fixtures in the 1950s and 1960s, during which time they also roamed the country as an in-demand headline act or as support for the star comedians of the day. Both had promising separate careers – Johnson as a solo vocalist, radio host and actor, Carr as lead singer with the Keynotes – before coming together for the fateful Eurovision contest in Cannes, France. Having married in 1955, their long career enjoyed a last moment in the sun in Mike Ockrent’s 1987 revival of Stephen Sondheim’s Follies at the Shaftesbury Theatre. Starring Diana Rigg and Julia McKenzie, it marked one of their final live appearances together. Born in Surbiton, south-west London, Johnson left school at 14 and by the age of 18 was a professional drummer on cruise ships and with his own short-lived band. His first brush with fame came in 1948 as a presenter on pirate broadcaster Radio Luxembourg, where he hosted the UK’s first Top 20 hit parade. Other firsts included The Moment I Saw You with American star Jo Stafford in 1951, the duet recorded separately on both sides of the Atlantic and later edited together without the duo ever meeting. Johnson’s radio appearances in the 1950s included several thriller series on the Scottish Home Service, the last, alongside Petula Clark in 1957, in Edward Boyd’s The Runaway Stag. Together with Carr, the same year he was seen in his first Royal Variety show, The Stage describing them as “one of the most polished singing acts of this microphone age”. Regular panto appearances followed their 1955 debut in Cinderella (Alexandra Theatre, Birmingham), their burgeoning fame fuelled by supporting Bruce Forsyth in Show Time at Blackpool’s North Pier (1960) and Every Night at the Palladium (1962) in London. Perennial summer season favourites, they shared bills with Arthur Haynes (Scarborough, 1964), Al Read (Blackpool, 1967) and Ken Dodd (Bournemouth, 1969). In 1968, they were part of the first British variety show to be ‘exported’ to Canada – The London Palladium Show, headlined by Morecambe and Wise – produced by the then 24-year-old Michael Grade. In the 1970s Johnson became a regular voice presenting on BBC Radio 2, although he and Carr enjoyed late flourishes with the John Inman-starring Fancy Free in summer seasons in Great Yarmouth (1977) and Bournemouth (1978) and in a Bing Crosby tribute in the mid-1980s. When Follies closed after 18 months in 1989, the pair went into semi-retirement, although Johnson remained a stalwart competitor with the Vaudeville Golfing Society. They spent their later years at the Royal Variety Charity’s Brinsworth House in Twickenham. Edward ‘Teddy’ Victor Johnson was born on September 4, 1919, and died on June 6, aged 98. He is survived by his wife, Pearl Carr.